Math-Aids.Com is a free resource where you can make an unlimited number of printable math worksheets for the use in the classroom or at home for extra practice. The flexibility and the text book quality of the math worksheets make Math-Aids.Com a very unique resource for people wanting to create and use Math Worksheets. The worksheets produced within this site are based on the common core state standards initiative for mathematics. All content on Math-Aids.Com may be reproduced for classroom or personal use. Reproduction of this material for use on other websites, publications, or teachers sites are strictly prohibited. If you find Math-Aids.Com to be valuable to you personally, please share it with your friends, family, and colleagues. We have added share the site buttons on the site and hope you will use the EMail button on the left of this page, and send this site to people that will use our great math worksheets. Help us out by sharing this site on Twitter, Facebook, Digg, MySpace or any social network. Simply use the buttons on the left and select the More Destinations button if you want to see a list of all of the networks available. 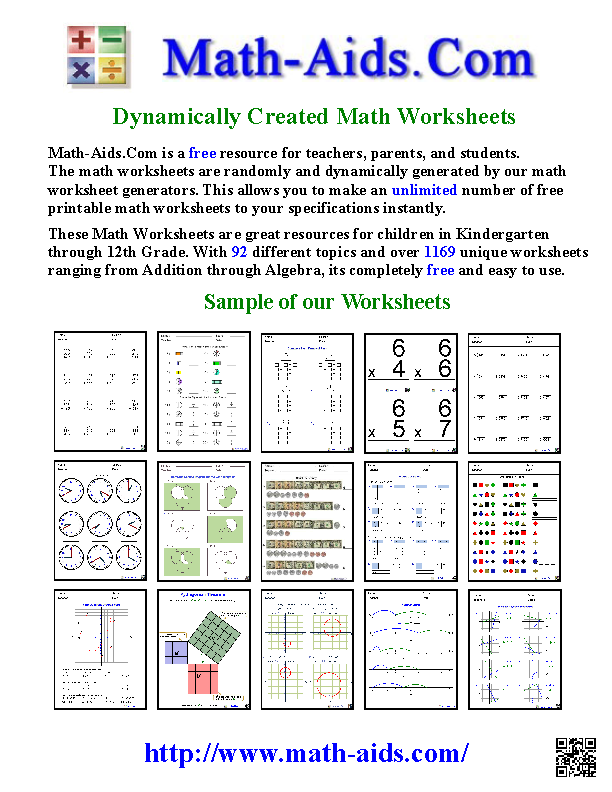 If you like our Math Worksheets and can link this website on any webpage or blog, we would really appreciate it. Every page or blog that links to us is a vote that matters in the eyes of the search engines, and it is the best way to pay us a compliment. Math-Aids.Com Flyer and posting it on bulletin boards at your school.